Until now, inclusion has been all but impossible to measure. Now, Lead Inclusively’s proprietary psychometric assessment tool is able to measure the inclusive leadership qualities that drive business performance and innovation. The LI3 is a simple, fully-automated way to assess organizational leaders across the key aspects of inclusion that produce the greatest ROI through increased employee engagement, talent development, innovation and business performance. It provides a personalized report and future-forward action plan delivered immediately, while delivering valuable data insights to the company on organizational strengths and growth opportunities. The assessment can be taken as a self-assessment or as a complete 360 and takes only ten minutes to complete. We hope you enjoy the short demo video. 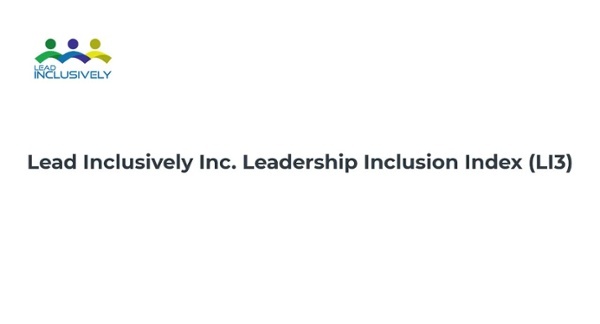 If you are interested in learning more about how the LI3 can help transform and sustain an inclusion culture as well as accelerate innovation and business performance, contact one of our consultants at info@leadinclusively.com. We look forward to being part of your inclusion journey! Harness the vital intersection of inclusion and innovation behaviors that drive organizational performance.